European Environment Agency – In transition: Can humans become a benign part of nature? We talk a lot about start-ups and disruptive innovation in business. But last week, I visited a start-up of the future. It is called Stedsans in the Woods and it was the perfect place for reflecting on how we can transform the way we lead and the way we create value. Business-as-usual is degenerative. In fact, anything that takes more value than it generates is terminal in the end. It cannot last. But how can we shift from degeneration to regeneration? How can we add more value than we take? And what does this mean for innovation and leadership? That was the learning journey that we embarked upon with a great group of business execs, entrepreneurs and intrapreneurs. The program was a combination of outside masterclasses (the picture above was our class room), systems thinking exercises, nature exploration and storytelling, mindfulness practices, campfire circles, nature alone time and meditation. The three days were facilitated by World Economic Forum Young Global Leader & Sustainability Expert Laura Storm, by Giles Hutchins, Author of the Nature of Business & Future Fit and previously Global Sustainability Director for Atos and myself. A short video of the experience & testimonials of the participants will be posted on the regenerators website soon. 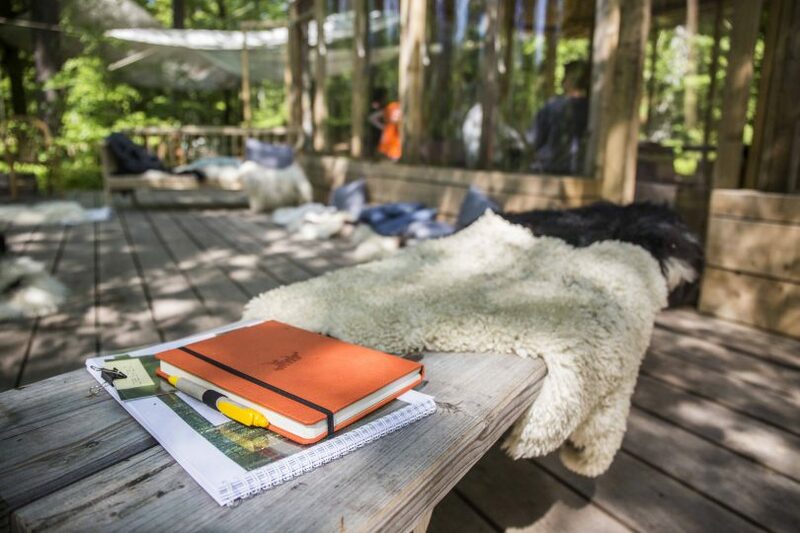 Stedsans in the Woods offers visitors a deep nature immersion experience that builds on the notion ‘take care of the place that takes care of you’. It is completely founded on a logic of doing well by doing good: build with local materials, close water and nutrient cycles, use local & organic food and only life-friendly products. It is a pocket of the future that you can visit in the present and one of the best examples of regenerative business logic I have come across. Can’t wait for the next visit.